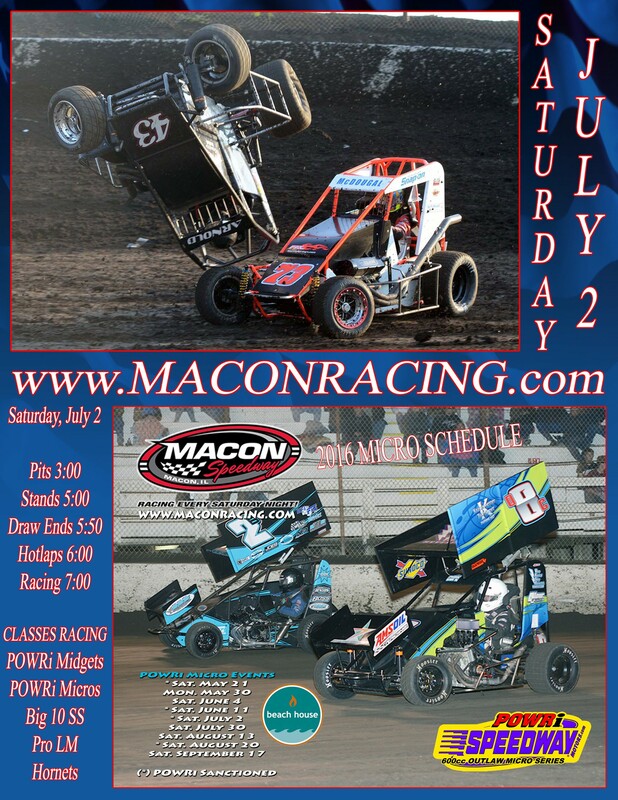 This coming Saturday, July 2, Mighty Macon IL Speedway will have its fourth visit of the season from the quick and nimble racers of POWRi. Drivers from a number of different states will be competing with the POWRi Lucas Oil National Midgets, a fan favorite of many. The wicked fast POWRi Speedway Motors Micros will buzz around the 1/5-mile track as well. To top it off, fans of the stock car variety will get to see their UMP Pro Late Models, a Big 10 Street Stock event, and the UMP Hornets. Minden, Nevada driver, Tanner Thorson, currently leads the 2016 POWRi Lucas Oil National Midget standings, claiming a series’ leading six wins in 17 starts. However, former champion, Zach Daum from Pocahontas, IL, is hot on his heels just 20 points behind. Daum has one win with twelve top fives in 16 starts. Rounding out the current podium is Lebanon, IN driver, Spencer Bayston. Bayston sits just 30 points back of the top spot in what will be a battle down to the wire in this season’s championship race. When it comes to Macon, there have been three different winners in the three national midget events this season. On April 23, Carl Juncton, MO driver, Andrew Felker, took the win followed by Tucker Klaasmeyer and Austin Brown. On May 21, it was Spencer Bayston in victory lane with Justin Peck and Colten Cottle taking podium spots. The most recent POWRi event at the Central Illinois facility was during SPEEDWEEK on June 11. On that night, Leemoore, CA driver Carson Macedo tasted victory, while Thorson and defending point champion, Darren Hagen scored second and third. Adding to Saturday night’s open wheel fun will be the POWRi Speedway Motors 600cc Outlaw Micro series. Currently leading the standings is Concordia, MO driver Nathan Benson. Despite being at the top of the list and one of the favorites for Saturday night, Benson has not claimed a win since April 29 but does have five second place finishes to go along with a pair of thirds and a fourth. Local fans will be pulling for Benson’s closest point challenger Jeremy Camp, who is from nearby Blue Mound, IL. Camp has a pair of wins this year, one at Macon and the most recent one at Lincoln. Rounding out the podium spots at this point is Sherman, IL driver Shelby Bosie. Bosie, much like Benson and Camp has two wins this season. In POWRi Speedway Motors Micro events at Macon this season, Frank Galusha of Lincoln, Nebraska took the checkered flag on April 23 with Matthew Howard and Nick Howard in tow. On May 21, the local, Jeremy Camp took the trophy back to Blue Mound, IL, while Benson and Levi Curry finished with podium spots. The most recent race was during SPEEDWEEK on June 11 where Nick Howard finished in victory lane with Camp and Evan Weyant second and third. Much like the national midgets, the micros also have not had a repeat winner. For fans of stock cars, a variety will also be on track this week. Leading the list will be the UMP Pro Late Models after a thrilling feature Saturday complete with slide jobs, crossovers, and outright great racing for the lead last weekend. In last week’s event, Springfield, IL’s Matt Taylor got back to victory lane to continue his outstanding season. He did so, coming from the fifth starting spot and racing with Jake Little, Kyle Logue, Nick Bauman, and Guy Taylor. With the win, Taylor has taken a 34 point lead over Roben Huffman in the Macon standings. Little, Guy Taylor, and Cody Maguire complete the top five. This Saturday will be a big event at Macon Speedway for the Midwest Big Ten Series Street Stocks. So far, three events have been held for the Big 10 Street Stocks, with Decatur, IL driver, Dave Crawley, Jr. leading the way. Crawley has been nearly unbeatable behind the wheel this year, winning Street Stock races at Lincoln and Macon and finishing second at Jacksonville to put him on top of the Big 10 standings. Crawley also has been top notch in his Modified, winning six Macon features and leading the points by a large margin. Other Street Stock drivers going for this Saturday’s $500 top prize include Kyle Waters, Terry Reed, Jeremy Nichols, and John Farris. Rounding out this week’s racing will be the UMP Hornets. Blue Mound, IL driver, Tony Reed leads the track standings, claiming a win on May 30 to go along with three second place finishes. Reed is thrashing on the car this week, trying to repair it from a feature crash Saturday night. Jerad Matherly sits second in the standing with Mike Gossett third, Cook Crawford fourth, and Ryan Cantrell fifth. Pit gates will open this Saturday at 3:00, grandstands at 5:00, local division pill draw ends at 5:50, hotlaps begin at 6:00, and racing will take the green at 7:00. Grandstand admission is $15 for adults and free for kids 11 and under.